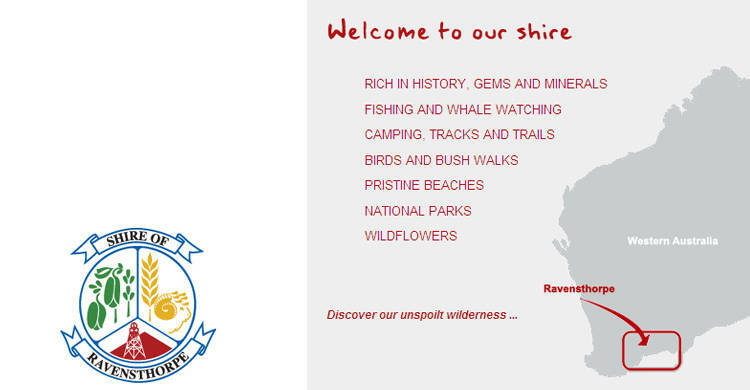 The Shire of Ravensthorpe covers 13,533 sq kilometres in the south of Western Australia. It encompasses several national parks, including the Frank Hann in the north and the world Biosphere, Fitzgerald River National Park on the coast. With a population of 1,400 the main industries are farming, mining and tourism. The indigenous inhabitants were the Wudjari Aborigines, the first white pastoralists bringing sheep to Cocanarup in 1868. Gold was discovered in the area in 1898 and soon the rush began as hopeful prospectors made their way to the Phillips River Goldfield. Traditionally, the role of a Local Government was to concentrate on "roads, rates and rubbish". Today, Local Government has a responsibility to be more involved in community development - social, economic and environmental development. The Shire of Ravensthorpe, is proud to be involved development of our Shire. Council has a responsibility to create an environment for their residents that is safe, healthy and contributes to the quality of life of the broader community. Our region has many exciting opportunities and is entering an exciting period of growth and change. At times it will not be easy, difficult decisions will need to be made, with a strong Council body and support from all shire staff, it is easy to keep focused on those things we want to achieve. Adminstration Office open for public access; Monday - Friday 9.00am - 4.30pm. Monday - Friday 8.30 am - 5.00 pm.